Always order a scoop coater 1" larger than the area you are coating with liquid. 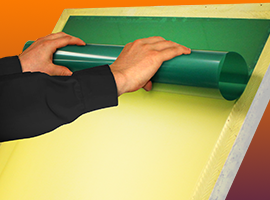 To enhance the stretch and durability for screen printed transfers that will apply to garments, add 15 percent (by weight) of a small-adhesive particle powder to the ink. Mix completely into the transfer ink and print through an 86 th/in (34 th/cm) screen mesh. A good article talks about how to take your screen making skills from beginner to expert. Follow the link below to read the whole article.